Epilepsy or Tumor Resection Surgery using Rapid Brain Mapping | Health Research, Inc. This technology enables rapid mapping of language function and motor function without subject participation. The primary market is for patients undergoing invasive brain surgery for epilepsy or tumor resection. Unlike current alternatives, the patient can be under anesthesia. Mapping is conducted without requiring the subject to actively respond to stimuli to trigger language or motor function responses. This is a significant improvement because it expands the number of patients that could benefit while also reducing the potential for seizure activity. Patients, such as those with brain tumors or epilepsy, may require resection of pathological tissue near language areas to prolong or improve quality of life. Given the high variability in structural anatomy (e.g. location, size) and function across individuals, neurosurgery carries inherent risks that include potential damage to language function. Current procedures require active patient participation (consciousness). Because more than 90% of patients are not conscious during surgery, they currently cannot benefit from functional mapping. Therefore, functional language mapping for precise localization and preservation of language can optimize surgical outcomes. 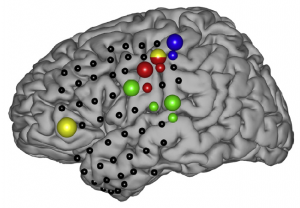 Functional language mapping has traditionally been achieved using electrical cortical stimulation (ECS) and functional magnetic resonance imaging (fMRI), and most recently using passively recorded electrocorticography (ECoG). Up to the present, the most widely used technique has been ECS, but its significant limitations have led to investigation into ECoG and fMRI as potential adjuncts or alternatives to ECS-based language mapping. Both ECoG and fMRI have the advantages of being “passive” methodologies, i.e. brain signals are recorded while patients perform a task but without “active” delivery of electrical impulses as in ECS. However, the use of fMRI is expensive and requires substantial expertise while ECoG is comparatively inexpensive and procedurally simple. Additionally, signal acquisition is passively recorded from subdural grids that either are already placed, or can readily be placed on the surface of the brain during typical surgical protocols. Brain mapping using ECoG is safe because it eliminates several risks associated with electrical stimulation (e.g., the risk of after-discharges and seizures), it can be rapidly applied, it is comparatively inexpensive, and it is congruent to existing technologies. Most importantly, our technology can produce functional maps not only when the patient is conscious and actively participates in guided tasks, but can also be applied in people that are under general anesthesia. HRI is seeking commercial partners to license methods for functional brain mapping during neurosurgery, clinical neurology and basic neuroscience research involving no patient participation in speech processing using recording electrodes on the surface of the cortex.